We had a great pick up in site views last week, thanks to a mention from Stonemaier games on the Scythe Kickstarter page, and some love from the Geekdad website too. Thanks guys! And if you’re new to the site, welcome aboard! Do say hello in the comments below, after I’m doing jumping semi-coherently from one topic to the next. Many, many years ago, I used to love a show called 2 Guys, a Girl and a Pizza Place. What should have been a standard, run-rate sitcom was elevated by several factors: its goofy, oddball sense of humour, Ryan Reynolds in a leading role, and also Nathan Fillion’s first major TV appearance. But other than being hilarious and seeding some serious man-crushes, every year for Halloween it threw the sitcom template out the window and did crazy specials that involved axe-murdering doppelgängers, mad scientists and body swaps. The very next week things would return to normal, and no-one would ever mention the laboratory they found in the basement or the body count. 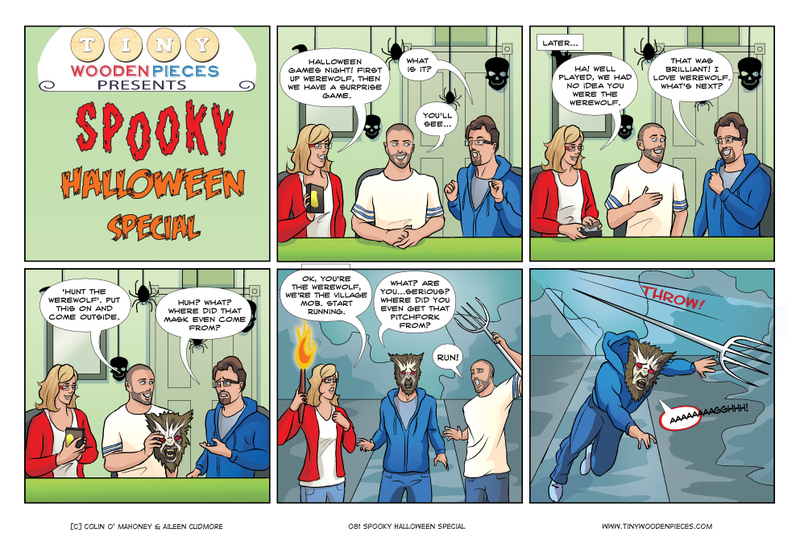 I loved those Halloween specials, and want to make it a Tiny Wooden Pieces tradition. To have a little fun and maybe even indulge in a little axe-murdering. ‘Tis the season, after all. We also did a horror-themed comic last year, based on Arkham Horror. It’s a two-parter, and It starts here, and you can find our Elder Sign comic here. And if you’re the kind of monster whose lust for blood and terror isn’t satiated by all those comics, we also covered Dead of Winter here and here. I was one of the many who saw the mention on GeekDad. I love this site so much. This is my life (if my wife were the gamer instead of just me and my two sons, 10 and 11). I’ve added so many games to my wishlists after reading every comic on here in less than 24 hours. (My work productivity can finally return to normal now that I’m done… Don’t tell my boss.) The Acquisition disorder is my favorite because it’s so true. I currently have about 10 brand new games that have yet to hit the table including Pandemic, Castles of Mad King Ludwig, Carcassonne, 4-5 deck builders, and Epic Card Game. Thank you so much for this web comic you guys do. I know I’ll be looking forward to this every Friday. Loving it. I too loved Two Guys a Girl and a Pizza Place! Surprisingly fun show! Hooray! I’ve actually been re-watching it on DVD, and it (mostly) holds up surprisingly well, which I was delighted with. I remembered it being so good, but hadn’t seen it in so long that I wasn’t sure if it would hold up at all. He should have suspected something as soon as you proposed Werewolf with 3 players. “We had no idea you were the werewolf” indeed! I know, right? Hard to believe we’re closing in on 100 comics!